Now I now some people think this is the fake video, though they are wrong since it captures Mr. Wright perfectly. Look at all his acrobatic skills with the spinning and flipping. Never underestimate the power of the Giant Phoenix Finger. Who can forget back-to-back OBJECTIONs at 1:38 in the video followed by a victory coffee break. You do realize two defense attorneys are battling each other over a single client. Phoenix Wright really should be doing his Lvl 3 Hyper Combo against She-Hulk instead of Doctor Doom. Phoenix Wright may be able to almost break the 4th wall like Deadpool though I know She-Hulk is already top-tier and has much more functional stun moves. Just imagine She-Hulk doing her anti-air Hyper combo and whipping Phoenix around in the air. I hope Capcom includes a coffee drinking taunt for Phoenix which also does damage so he can KO She-Hulk with that move. Phoenix plays a lot differently than other fighters in that he needs to search for three pieces of evidence in order to do his final hyper. He has the option of throwing away "bad" evidence and there are two modes for Phoenix. There is the evidence mode and the courtroom mode, each with their own moves. From a gameplay standpoint, Phoenix appears to be too difficult to use when compared with Nemesis who just does tons of damage to people with simple combos. Phoenix Wright's best move I can see is the Objection Finger, though he can only use it when he has three pieces of evidence and it has a countdown timer. Otherwise, I would be spamming "I will submit the evidence" as much as I could as well as whatever his blue projectile is supposed to be. It's obvious I'll be playing Ultimate Marvel Vs. Capcom 3 just for these new characters. It's still a huge travesty Capcom has the guile (heh) to still charge for Jill and Shuma-Gorath as DLC characters when there is no reason to not include them with this really unnecessary expansion game. 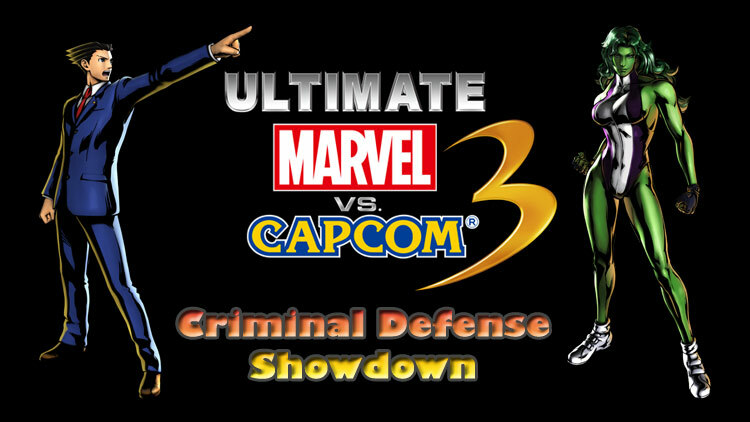 Next I'll be expecting to see Super Ultimate Marvel Vs. Capcom 3 next February since the original game came out then. *Images from the Ultimate Marvel Vs. Capcom site.